274 pages | 28 B/W Illus. Recent agri-food studies, including commodity systems, the political economy of agriculture, regional development, and wider examinations of the rural dimension in economic geography and rural sociology have been confronted by three challenges. These can be summarized as: ‘more than human’ approaches to economic life; a ‘post-structural political economy’ of food and agriculture; and calls for more ‘enactive’, performative research approaches. This volume describes the genealogy of such approaches, drawing on the reflective insights of more than five years of international engagement and research. It demonstrates the kinds of new work being generated under these approaches and provides a means for exploring how they should be all understood as part of the same broader need to review theory and methods in the study of food, agriculture, rural development and economic geography. This radical collective approach is elaborated as the Biological Economies approach. The authors break out from traditional categories of analysis, reconceptualising materialities, and reframing economic assemblages as biological economies, based on the notion of all research being enactive or performative. "In Biological Economies, Le Heron and colleagues offer up a path-breaking analysis at the nexus of key agri-food studies issues and propel the reader through existing contradictions and tensions to help us imagine how agri-food systems can be transformed. In defining key international strands, this book enables the reader to both understand the state of the art in food studies and to reconstitute the pieces we have on hand into a more productive whole." – Alison Blay-Palmer, Centre for International Governance Innovation Chair in Sustainable Food Systems, Waterloo, Canada. "If we are what we eat, then who do we become when we choose to eat differently? This brilliant book offers inspiring answers to this important question. It ranges far beyond the familiar criticisms of processed food, fast food and chemical-intensive farming. It presents arguments for, and examples of, new and better ways to embed food in our material and moral lives." – Noel Castree, University Manchester, UK, and University of Wollongong, Australia. "An important and timely intervention in agri-food studies, Biological Economies has ‘mind-melting’ ambitions – disrupting orthodox categories and fostering a new research agenda. Radically relational, the book’s transformative potential is illustrated via a series of provocative case studies." – Peter Jackson, University of Sheffield, UK. "If you like your agrifoodstudies savvy, layered, decentred, well-storied and lively, this is your book! The cases are varied, the curiosity and dedication run all the way through." – Annemarie Mol, University of Amsterdam, the Netherlands. 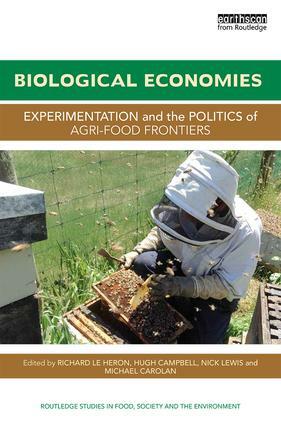 "Biological Economies is a fascinating collection that breaks new ground in agri-food research. Conceptually and methodologically innovative and supported by rich and diverse case studies, this is a must-read for anyone interested in the political-economies of food in the twenty-first century." – Michael Woods, Aberystwyth University, UK. 12. Enacting BAdairying: Towards an Emergent Politics of New Soil Resourcefulness? Richard Le Heron is Professor of Geography, School of Environment, The University of Auckland, New Zealand. Hugh Campbell is Chair of Sociology, Department of Sociology, Gender and Social Work, University of Otago, New Zealand. Nick Lewis is Associate Professor in Geography, School of Environment, The University of Auckland, New Zealand. Michael Carolan is Chair of Sociology, Department of Sociology, Colorado State University, USA.